Have an upcoming event or party in the Orlando area? Maybe an awards ceremony at the Orlando Museum of Art? Or a gala at The Peabody Orlando? You might be surprised to discover that arranging for the biggest names in entertainment to appear at your Orlando event is easier than you imagined. For almost twenty years, Booking Entertainment has been helping clients with full-service turnkey concerts and events, including big name entertainment for their Orlando area events, all in one no-surprise price. Almost any band, comedian, or performer is available to help make your Orlando area event a genuine success. Let's start with our easy, no-obligation Entertainment Request Form, through which you can answer some essential questions about your Orlando area event. 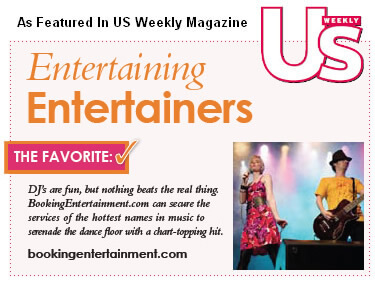 Booking Entertainment is delighted to take its almost twenty years of experience in the business and use it to create an exciting experience for your Orlando area event.